Is there a conspiracy created by major manufacturers and retailers to get you to rip out your existing countertops and replace them with all new counters? It would seem so. 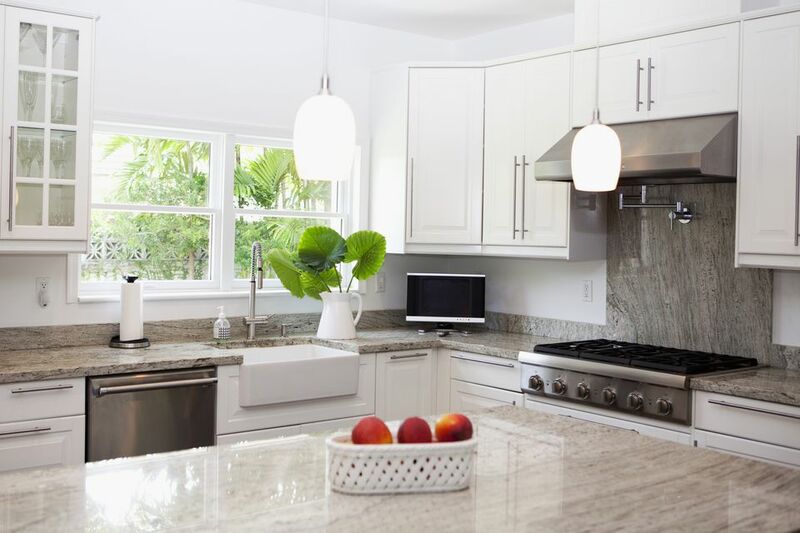 It is possible to cover existing counters with a hard slab of granite, solid surface, or quartz, including edges and backsplashes, doing so on a DIY basis, making it a relatively fast process, and spending hundreds instead of thousands. These are variously called overlays, granite counter units (GCUs), or modular granite. Overlays cover your existing countertop in the form of large, dry, thick, pre-cast slabs. So, by "dry," that does not include the category of countertop fixes such as Rustoleum's countertop transformations, a multi-stage liquid covering. By "thick," that means that this is not film printed with the image of granite. It is real granite. What Overlay Materials Are Available? Engineered stone, natural granite, and concrete. Concrete is not a big market for overlays, but there are currently one or two that offer this. Can You Really Install on Your Existing Countertop? Yes. That is one of the attractive qualities of mini-slabs. As long as you have a strong, stable counter, you can lay the slabs directly on top. Of course, you can also remove your existing counter and lay down a new base of plywood and cement board. The idea behind mini-slab overlays is to fully cover the depth of your counter (front to back measurement), minimizing seams. So, a typical overlay slab will measure out at 16" to 18" wide by 26" to 26.5" deep, with a thickness of 2." An 18" x 26" mini-slab works out to be 3.25 square feet and about 23 pounds. Do I Have to Do Any Cutting? If you have straight or L-shaped countertop configuration, you shouldn't have to cut the stone. The two tricky spots are around the sink and at the corner. As for the sink, you can buy sink kits of pre-cut stone, so that you only need to install the stone and set the sink in place with no cutting involved. Corners can be approached in at least two ways. You can lay two perpendicular slabs and fill in the square with a like-size slab of granite. Or you can have two slabs that are cut at 45-degree angles and join at this cut. The second version means you have one less seam. By default, the front edge should be flat and polished. If you prefer an overhang (apron), it's possible to purchase slabs with an apron attached, or you can purchase extra-deep slabs and cut off the back inch and reattach as an apron to the front. The missing rear inch is filled in with similar material backsplash. How Can I Minimize Seams? The first—and most obvious answer—is to plan well. Make sure you are dealing with full slabs as much as possible. Second is to eliminate lippage when installing. Lippage is a vertical difference between two slabs. Lazy Granite advises against using what they call "wild colors" if you want seams to disappear. This is because the distinctive patterning on one side will not be matched on the other side of the seam. They also say that colors like dead black or other uniform colors will show seams. Recommended is "something like mint brown granite" or other stone that has a consistent grain. DIY-Friendly: Overlays are specifically designed for the do-it-yourselfer. Newly engineered stone or slab counters are not DIY-friendly. Greener: You save the expense of sending your existing counters to the landfill. Additionally, it is considered "greener." Better Than Tiles: Instead of mini-slabs, consider them "giant tiles." So, rather than 60 linear feet or greater of seams, as you would have with tiles 12" or smaller, you might have as little as 10 linear feet of seams for a 10' x 10' kitchen. Seams: Because you are not using large, continuous slabs, there will be a few visible seams. After a while, though, homeowners do not notice seams so much. Shipping Cost: One major cost driver is the fact that you may find it difficult to find granite overlays locally; thus, you will need to order online and incur shipping charges. Many of the overlay companies we surveyed charged as much for shipping as they did for the product. For example, the shipping charges for six mini-slabs of 18" x 21" each totaled $199 for only $149.70 of product. Yet when we increased the order over $600, shipping was free. Overlays are purchased per-piece, and pieces run around $50 to $100. Overlays are less expensive than conventional engineered stone or quartz countertops if only because they yield to do-it-yourself installation. There are not many companies. And of those that do sell overlays, a great number are rather sketchy; they don't instill a lot of confidence. But there are a few reputable dealers. Lazy Granite – This company has one of the most informative sites for mini-slab granite. Its ordering system is top-notch, and it is one of the very few companies that gives an online estimate of product and shipping costs. Kitchen In a Box – Bedrock Creations ships its ready-made modular granite tops for $95. It has an online quote system. EZ Granite – Another major mini-slab provider based in Newark, CA. However, its site is so poor as to be almost unusable. Panda – Panda is sold only through BuildDirect.